Yogita Goyal’s research examines the literature of the African diaspora, with a particular emphasis on African American and African literature and theory. 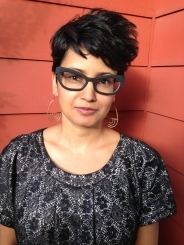 Yogita Goyal is Professor of English and African American Studies at UCLA. She is Editor of the journal, Contemporary Literature, for British and Anglophone Fiction, and President of the Association for the Study of the Arts of the Present (A.S.A.P.). She specializes in modern and contemporary literature and the study of race and postcolonialism, with a particular emphasis on African American and African literature. Her first book, Romance, Diaspora, and Black Atlantic Literature (Cambridge University Press, 2010), shifts the center of black diaspora studies by considering Africa as constitutive of black modernity, rather than its forgotten past. She is guest editor of a special issue of Research in African Literatures (2014) on “Africa and the Black Atlantic” and editor of the Cambridge Companion to Transnational American Literature (2017). Her book on the contemporary revival of the slave narrative as a new world literary genre, Runaway Genres: Global Afterlives of Slavery, is forthcoming from NYU Press in 2019. Goyal’s research and teaching explore the relation between race and empire, nation and diaspora, and past and present in a broad range of African diaspora literature from the nineteenth century to the present. Most of her work foregrounds the articulation of literary form with social and political change, with a view to rethinking questions of social justice and ethics in historical and continuing forms of inequality. Goyal’s work has been supported by fellowships from the ACLS (2016-2017), the University of California President’s Office (2007-2008), and the NEH (Scholar-in-Residence at the Schomburg Center for Research in Black Culture, New York Public Library, 2003-2004). She was Chair of the Publications Committee of the American Comparative Literature Association for 2015-2018, and serves on the Founding Editorial Board of Oxford Bibliographies in Literary and Critical Theory. A member of the MLA Delegate Assembly from 2016-2019, she serves on the Executive Committee of the Postcolonial Studies Forum for 2018-2023 and the Advisory Council for the American Literature Society for 2018-2020. Since 2014, Goyal has a split appointment with the Department of African American Studies. She regularly teaches classes on slavery, African diaspora literature, the global novel, and postcolonial studies, and was the Director of Departmental Honors for English from 2013-2016. 2018. “No Strangers Here.” Los Angeles Review of Books. 2017. “We Need New Diasporas,” American Literary History, 29 4.1 (Winter): 640-663. 2017. “Third World Problems,” College Literature 44.4 (Fall): 467-474. 2017. “The Logic of Analogy: Slavery and the Contemporary Refugee,” Dossier on Contemporary Refugee Time-Spaces, ed. Angela Naimou. Humanity: An International Journal of Human Rights, Humanitarianism, and Development. 8.3 (Winter): 543-546. 2017. “The Genres of Guantánamo Diary: Postcolonial Reading and the War on Terror.” The Cambridge Journal of Postcolonial Literary Inquiry. Special issue on Postcolonial Reading Publics, ed. Ankhi Mukherjee, 4.1: 69-87. 2017. “Coming Home from Irony.” Interview with Percival Everett, Los Angeles Review of Books. 2017. “The Transnational Turn and Postcolonial Studies,” Cambridge Companion to Transnational American Literature, ed. Yogita Goyal. Cambridge University Press, 53-71. 2017. “Introduction: The Transnational Turn.” Cambridge Companion to Transnational American Literature, ed. Yogita Goyal. Cambridge University Press, 1-15. 2016. “Black Diaspora Literature and the Question of Slavery,” Edinburgh Companion to Atlantic Literary Studies, eds. Leslie Eckel and Claire Elliott, 146-160. 2016. “Romance and Realism.” Oxford History of the Novel in English. Volume 11: The Novel in Africa and the Caribbean since 1950, ed. Simon Gikandi. Oxford University Press, 301-315. 2016. “African American Literature, Criticism, and Theory.” The Encyclopedia of Postcolonial Studies, eds. Sangeeta Ray, Henry Schwarz, José Luis Villacañas Berlanga, Alberto Moreiras, and April Shemak. Blackwell. 2015. “Gender and Geomodernisms” Cambridge Companion to the American Modernist Novel, ed. Joshua Miller. Cambridge University Press, 89-105.